The $31.6 million awarded to Washington University of St. Louis (WUSTL) in a lawsuit levied against its patent license partner the University of Wisconsin is a reminder that co-development deals can come crashing to the ground years after they were initiated. And when they do, more often than not the cause is traced to poorly defined terms. As co-development agreements become more prevalent, universities also may need to pay more attention when another entity is given the power to assign relative value to patents involved in a license, because millions can be lost if those valuations are skewed. A court recently ordered the University of Wisconsin to pay WUSTL for breaching a royalty agreement related to the sale of a drug used in treating kidney disease. Researchers from the two universities collaborated on research in the 1990s and applied for the drug patent in 1995. They agreed to have the University of Wisconsin’s licensing arm, Wisconsin Alumni Research Foundation (WARF), handle licensing of the patent, known as the ‘815 patent. In 1998 WARF licensed the patent to Abbott Laboratories, which later spun out AbbVie and used the patent — along with dozens of others — to create the blockbuster kidney drug Zemplar. More recently Washington University questioned the royalties passed on by WARF and in a suit filed in 2013 claimed that WARF breached the terms of the agreement by undervaluing the patent. In addition to breach of duty, WUSTL claimed a breach of fiduciary duty and a breach of the covenant of good faith and fair dealing. Washington University had received less than $1 million in royalties from the patent when it pursued litigation, while WARF had received more than $426 million. The university sought more than $38 million in the lawsuit and was awarded $31.6 million. WARF has stated that it is considering an appeal. The court seems to have focused on the claim concerning a breach of the covenant of good faith and fair dealing, says J. Derek Mason, PhD, CLP, partner with the Oblon intellectual property firm in Alexandria, VA. Though not spelled out in this or most other contracts, the covenant of good faith and fair dealing is an accepted tenet of contract law, Mason explains — a presumption that parties to a contract will deal with each other honestly, fairly, and in good faith. The no-so-fair dealing was related to how the agreement granted WARF the authority to license the patent, which included the authority to assign relative value to any patents involved in the license, Mason says. When WARF granted a license to Abbott that included the patent in question, it also included almost three dozen other patents. WARF assigned 70% of value to compound patents owned by WARF, lumping the ‘815 patent co-owned with WUSTL into what it called “ancillary patents.” There were 31 patents in that group with total value of 30%, meaning each one accounted for less than one percent of the value of the contract. At the subsequent trial, Washington University attorneys said WARF told the university in 2013 that the patent was “meaningless and largely irrelevant.” Evidence indicated, however, that WARF told Abbott in 1998 that the patent “directly supports” Zemplar. Although WUSTL ultimately prevailed in the case and was awarded most of the money denied to them through the relative value assessment, it took years and costly litigation. Mason says the case should serve as a lesson to retain some control over how patent values are assigned. 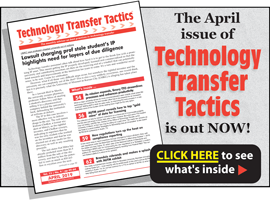 This full article appears in the January issue of Technology Transfer Tactics. To subscribe and access the full article, along with the publication’s 11+ year archive of best practices and success strategies for tech transfer professionals, CLICK HERE.